Good Friday Explained (2018) from Church of the Resurrection on Vimeo. Good Friday is a solemn remembrance of Jesus' sacrifice of his own life so that we might find forgiveness and reconciliation with God. This is not a somber recapitulation of Jesus' death, but rather a thankful and reverently joyful recollection of his death that gave us life. This day and the next—Holy Saturday—are the only two days of the church calendar when there is no Eucharistic celebration. Traditionally, this service can be held at three o'clock in the afternoon or later to mark the hour of Jesus' death according to the Gospels. It is believed that the liturgy for this service is derived from the earliest days of Christianity. The service begins in silence and with prayer. The clergy process into the room silently, dressed in black. In some traditions, they prostrate themselves before the cross at this point. Our readings for the day are from Isaiah's Suffering Servant poem (Isa. 52:13­–53:12) and from the sermon to the Hebrews in which the author explains Jesus' role as our great High Priest and Mediator (Heb. 10:1-25). At this time, we return to the same Gospel reading that we read on Palm Sunday—the Passion (John 18:1–19:37). This service also includes the praying of the Solemn Collects in which we intercede for the church, our nation, and the world. Our Communion for this service consists of wafers that have already been blessed during the previous night's Maundy Thursday Eucharist. Good Friday is not a Eucharist service because we are remembering that Christ's body was in the grave, and we are waiting for his resurrected body to bring us new life. Finally, we take time to venerate the cross. At Church of the Resurrection, we lay the cross down on the chancel stage, and all who are led take a few minutes to touch the cross and pray. It is a powerful time of connection to our sacrificial Savior. In the pilgrimage of Holy Week, Good Friday brings us to a somber and contemplative halt. From the moment the silent procession enters the sanctuary until we all leave in silence, we are invited into a focused contemplation of Jesus' death on the cross. Each scripture reading, prayer, and song points us to one man's experience on an ancient instrument of torture. Why? Because we believe that the moment Jesus died on the cross was the moment the entire world was rescued from sin and death. That is why we spend so much time savoring the reality of the cross. On Good Friday, we celebrate both the specific instant in history when Jesus redeemed us and the reality that it can meet us in our sinfulness today. We invite the Holy Spirit to give us the grace to acknowledge our personal sinfulness and and then to immediately find forgiveness available at the cross. It is a stunningly personal opportunity to ask the Lord to highlight the sins keeping us from drawing close to him and then to set those sins down on the wood of the cross. This is Part 4 of our "Peek into Holy Week" series. In the days leading up to Holy Week, we're taking time to prepare our hearts and minds so that we will be ready to hear the voice of the Lord. Read the next post about the Great Vigil of Easter here. Traditionally, the Stations of the Cross refer to images depicting the journey Jesus walked from his condemnation and sentencing at trial to the laying of his body in the tomb. The images are customarily displayed around the sanctuary of a church, and people are encouraged to visit the stations during Lent. At each station there are prayers, reflections, and scripture read. This journey is thought to have been adapted from the practice of very early pilgrims to Jerusalem at Easter who would follow Jesus’ path on the Via Dolorosa, which was thought to be the actual path Jesus took on his way to being crucified. The Stations of the Cross developed in order to provide this experience to pilgrims around the world, no matter where they might be. The fourteen stations begin with Jesus praying in the Garden of Gethsemane and end with his followers laying his body in the tomb. At Church of the Resurrection, we take a journey around our building together at two different times on Good Friday. An officiant and a musician lead the service. Each station is marked by a plain wooden cross. At each station we read the passage of scripture associated with that moment on Jesus’ journey and take a moment to reflect with song and prayer. Our Stations of the Cross service was designed by Pope John Paul II. 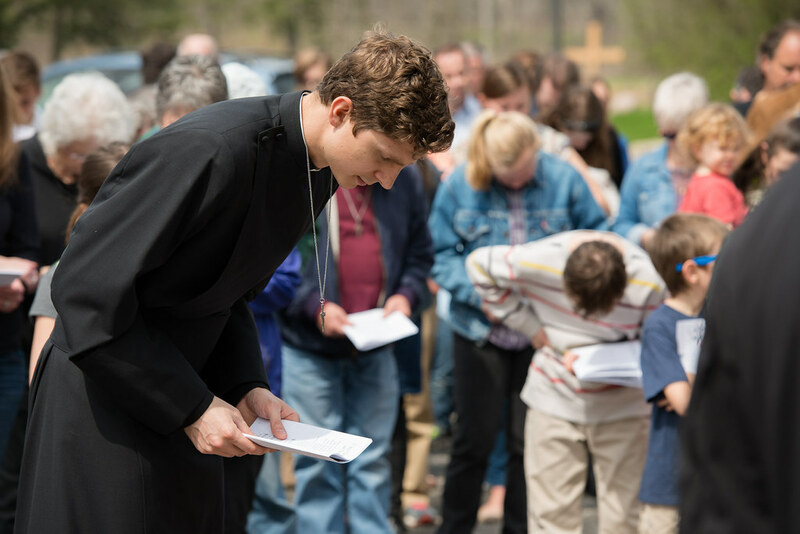 Amidst the intensely corporate pilgrimage of Holy Week, the Stations of the Cross stand out as an opportunity for a uniquely individual encounter with the Lord. With a liturgy of only two voices, no homily, and a multitude of scripture readings, this service is crafted to be a private devotional experience. We are invited into a one-on-one encounter with Jesus as we walk alongside him on the road to his crucifixion. As we contemplate each action that took place on Jesus’ journey to his death, we are invited to ponder the intentionality with which Jesus embraced his rescue mission. Each station takes Jesus deeper into betrayal, suffering, and death, thereby bringing us closer to the moment of our redemption. This paradox evokes an overwhelming love for our Savior as he suffers and stumbles, and it brings us hope amidst the darkness of human sin. Join us for Stations of the Cross on Good Friday, 4/14, at 12:30pm or 2pm. This is Part 3 of our Peek into Holy Week series. In the days leading up to Holy Week, we're taking time to prepare our hearts and minds so that we will be ready to hear the voice of the Lord. Read the next post about Good Friday here.